Parking: There is free parking for about 10 cars to park. Everyday, hundreds, if not thousands, of people pass by a historic landmark without even realizing it. It is interesting that so many people miss out on viewing the biggest tree in Connecticut and never know it. 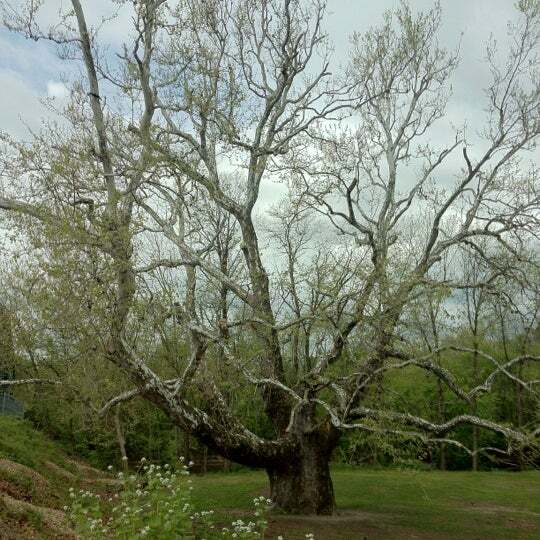 When it was most recently measured in 2016 by the Connecticut Botanical Society, the trunk of the Pinchot Sycamore Tree was listed at 28 feet (8.5 meters) around and 100 feet (30 meters) tall. It is estimated to be at least 200 years old and could be as old as 300 years. The tree’s branches sprout in various directions. With its thick, far reaching limbs, it could easily be used in a horror movie. The tree was named in honor of influential conservationist and Connecticut resident Gifford Pinchot in 1965. There was a re-dedication in 1975. There are two markers located by the tree. The first marker (on the left below) is a thank you to all of the groups who have worked to make the park possible. The second marker (on the right below) is the marker from the original dedication in 1965. You’ll note the tree’s circumference was recorded as being 23 feet and 7 inches (as opposed to the 28 feet it was measured at in 2016). To get a better sense of the size of the tree, take a look at the trunk of the this tree in proportion to this model. There is also a bench located near the back of the tree that is dedicated to Pauline Schwartz. The note on the bench states, “Come Have A Seat By Pauline Schwartz’s Favorite Tree” with some designs and, although it is slightly worn, an image that appears to be a person’s face. Pauline, a native of Bridgeport, CT, passed away in 2013 in Las Vegas, NV. A bench was dedicated in her honor because of her love of the park. Behind the tree, almost hidden from the park is a boat launch that offers views of the Farmington River. The entrance to the park is a little hard to find, unless you know where. ON Rt 185 just before or after the bridge, there are two green poles that mark the entrance to the park. The road to the parking lot is short but a little narrow. As I mentioned in the tips section, it’s probably better to fully appreciate the size of the during the fall, winter or spring when the leaves are off the tree, so you can see the full size of the tree without the leaves hiding the skeleton of the tree. Below is a photo of what the tree looks like without its leaves (from foursquare.com).